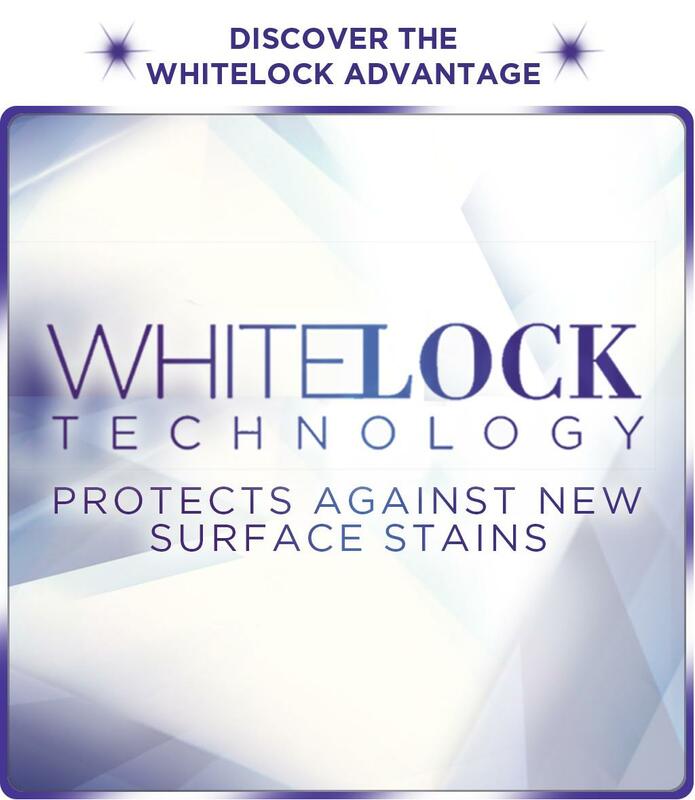 xclusive Whitelock Technology helps protect against future stains. Triple-action** formula whitens by removing surface stains. **Triple-action benefits: 1. Whitens teeth 2. Protects against surface stains 3. Kills bad breath germs. Discover your smile’s full potential when you use the complete collection of products from the award-winning 3D White brand. From whitening toothpaste to whitening strips, Crest + Oral-B 3D White has teeth whitening solutions to suit your oral needs. It’s never been easier to unveil your whiter, brighter smile to the world. Put the finishing touches on your morning and evening smile routine with Crest 3D White Luxe Glamorous White Whitening Mouthwash. It’s designed with a triple-action formula that whitens* teeth, prevents surface stains, and freshens breath. Its Whitelock Technology acts as a whitening protector that helps prevent new surface stains from forming. Crest 3D White Luxe Glamorous White whitening mouthwash is enhanced by your full teeth brushing routine. 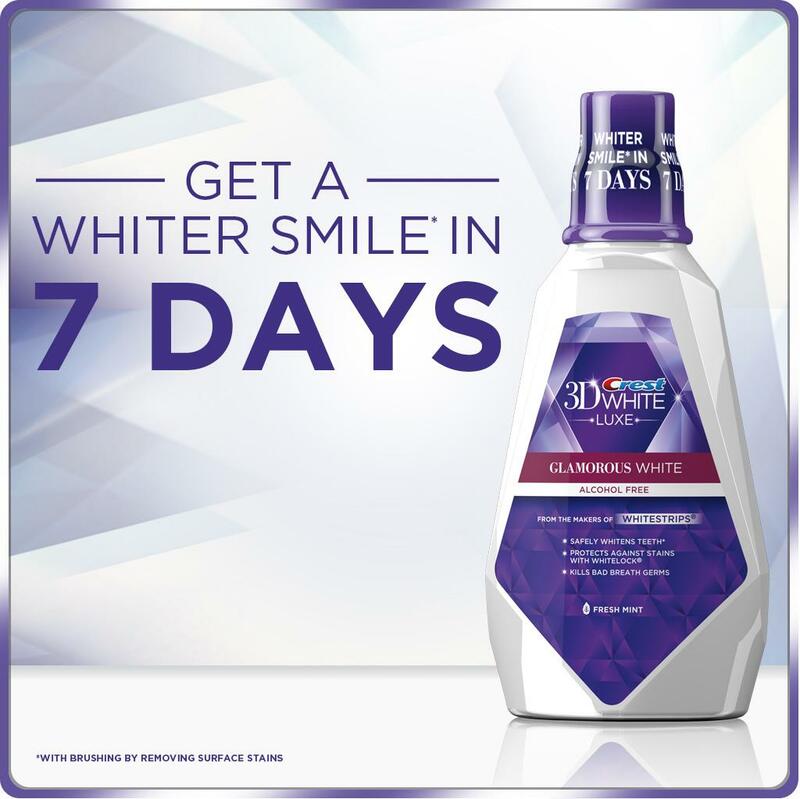 That means, you’ll get a whiter smile in just 2 days if you are rinsing with Crest 3D White Luxe Glamorous White mouthwash and brushing with an Oral-B 3D White Pro-Flex toothbrush and 3D White Luxe Glamorous White toothpaste together. Combined with the refreshing taste of Fresh Mint, Crest 3D White Luxe Glamorous White mouthwash is the perfect way to stylize your smile. *whitens teeth by removing surface stains. You take care of your skin, your hair, your fashion — so why not your smile? Take it from dull to dazzling in just 2 days* by using Crest 3D White Luxe Glamorous White toothpaste, Oral-B 3D White Pro-Flex toothbrush, and Crest 3D White Luxe Glamorous White mouthwash together. Also try Crest 3D White Supreme FlexFit Whitestrips for a whiter smile. And don’t forget Oral-B Glide 3D White floss picks – the finishing touch to your routine. Q: Is a whitening mouthwash safe for my teeth? A: Yes. Whitening mouthwash can gently remove teeth stains from everyday beverages like coffee, tea, wine and other stain-causing foods without harming your tooth’s enamel. Q: Should I alternate between whitening and regular mouthwash? A: Like most whitening mouthwashes, Glamorous White is safe for daily use. Plus, using a daily whitening mouthwash gives you whiter teeth with fresher breath. However, if you’re looking for other benefits beyond whitening, please consult your dentist. Q: Is it safe to use several teeth whitening products together? A: Absolutely. In fact, Crest 3D White designs its teeth whitening products to be more effective when used together without harming your enamel. 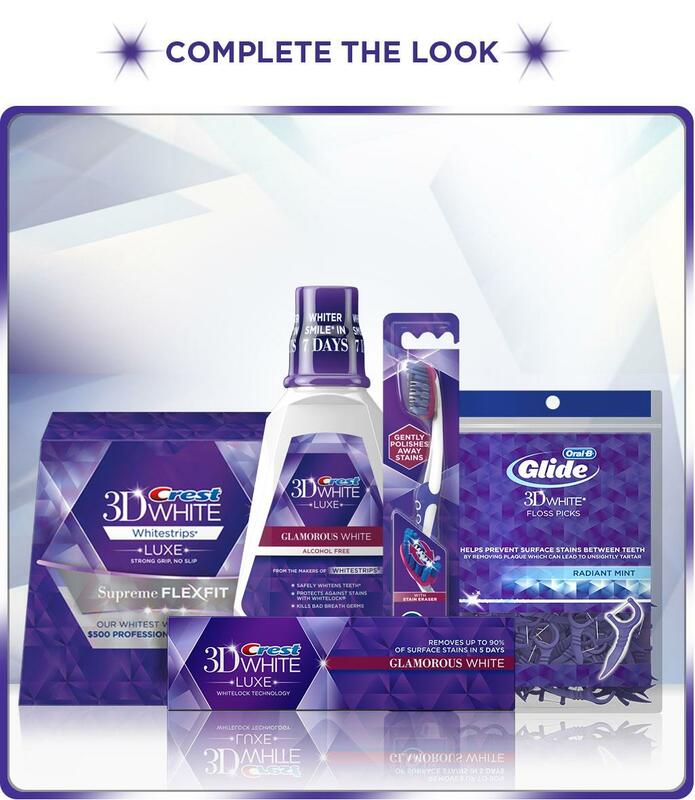 For whiter* teeth in just 2 days, use the 3D White collection together. *Whitens teeth by removing surface stains when using Crest 3D White Luxe Glamorous White toothpaste, 3D White Luxe Glamorous White mouthwash, and Oral-B 3D White Pro-Flex toothbrush together.